At Cloudless Chiropractic we have a lot of experience working with babies and children. 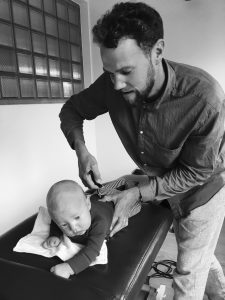 Founder, Chiropractor and father himself; Andrew Harvey has undergone extensive post-graduate education in this field and is a member of The International Chiropractic Paediatric Association (ICPA). If your baby is not sleeping well or is experiencing colic, cramps, constipation, irritability, difficulty breastfeeding or other symptoms, we can assess their whole body health. Chiropractic care can have a positive impact on these conditions. We provide gentle spine, hip and whole body checks, looking for any impacts birth trauma may have had on their nervous system, which could impact function and development. With years of paediatric experience, we know the complex signs to look for. We use specific assessment of your child and where necessary we apply gentle techniques to remove nerve interference. 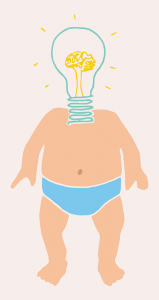 We also work with children experiencing developmental milestones delay. Delay to; roll, sit, crawl or walk. Poor neck strength, poor concentration, behavioural issues, bed wetting, asthma and more. Knocks, falls and other physical activities can cause spinal problems, causing poor nerve communication and the potential for health or development issues. Please do not hesitate to contact us, so we can inform you about the benefits of our gentle low force techniques for your baby or child.